Here are sketches of Lutea size XS and 2XL (the smallest and largest pattern sizes), drawn to scale on graph paper at 1 box to one inch, to fit bust sizes of 28-30" and 48-50", respectively. 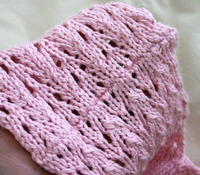 According to the Standards & Guidelines for Knitting & Crochet, the Cross Back (shoulder to shoulder) measurements for these two sizes are 14" and 18". As you can see, the lace shoulder sections also angle out slightly from the center, meaning that the width at the base of the lace sections must be slightly narrower than the width at the top. 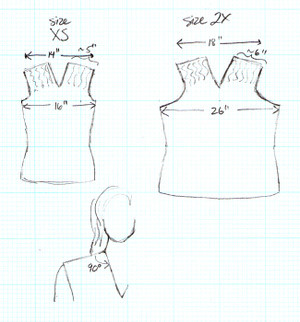 We'll keep it simple and say that the shoulder sections for sizes XS and 2XL must be 13" and 17" wide at their bases, respectively. This means that for size XS, for front or back, since the width at the bust is 16 inches, the armhole shaping must yield a decrease of 3 inches (16-13), or 1 1/2 inches on each side. However, for size 2XL, since the width at the bust is 26 inches, the armhole shaping must yield a decrease of 9 inches (26-17), or 4 1/2 inches on each side. Because angling the lace sections more would result in an overly sloped shoulder (since the sides of the lace section are perpendicular to the top of the shoulder), and angling them less would result in a too-narrow V-neck, AND making the shoulder section wider would make the top edge of the armhole form a shelf past the end of the shoulder--my only option was to make the armholes more deeply cut in the larger sizes. 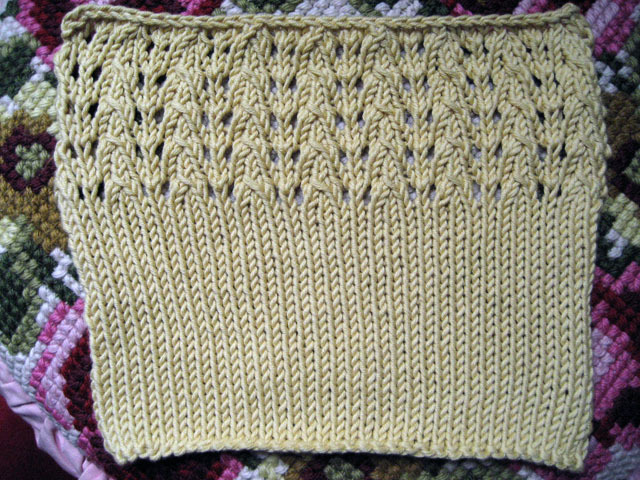 By the way, thanks to Connie, who brought me an issue of the summer 2007 Interweave Knits, last week I was finally able to see Lutea in print! It was my first in-person meeting of someone I met online, and it went so well that I'll have to try it again sometime. 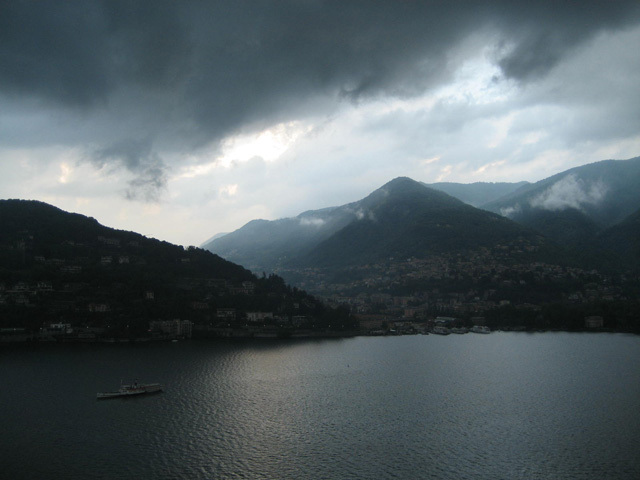 I'm afraid my sketch of Lutea's architecture will have to be put off for a post or two; without going into tedious detail, I will say that I've been uber-busy with both non-knitting matters (above: the view from my new home office) and non-bloggable knitting. "The first row of the lace pattern says: K2, *yo, k1, yo, k3, repeat from * to end. I do not have enough stitches for this to come out even. Is there a typo somewhere?" Well, either Interweave edited my original pattern for space, or they simply made an error, and omitted "end row with k2 instead of k3." Anyway, they now have corrections up on their website, and have essentially restored my original directions. Felicia also emailed me about the same paragraph in the pattern; she brought up the fact that the number of stitches changes on some of the rows of the lace pattern. IK does mention this in a note just before the directions for working each row of the lace pattern; in my original pattern submission, I added this note at the end of the directions for rows 1 (when the sts are increased) and 3 (when the original number of sts is restored). So read your directions carefully, knitters! But if you find this part of the "Lutea" pattern confusing, know that you are not alone. 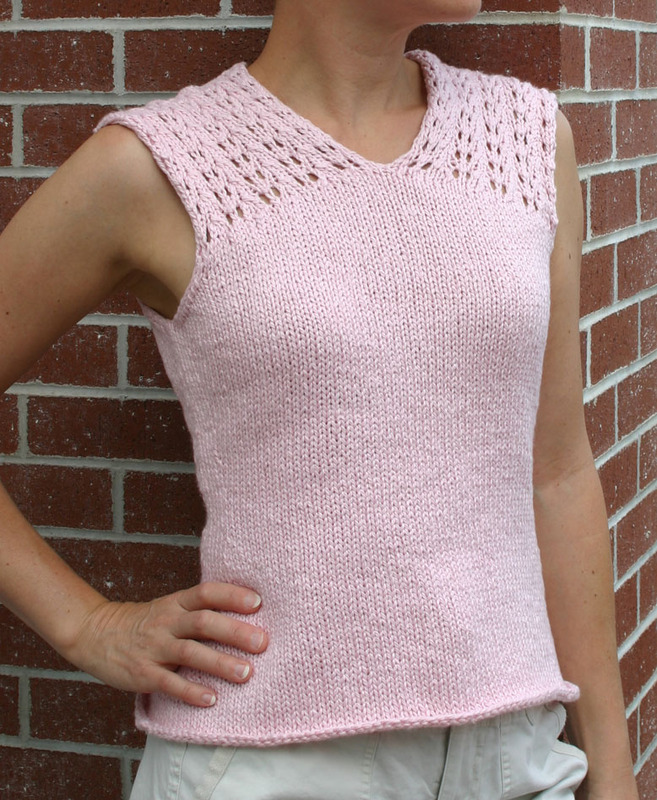 Have you seen the Summer 2007 interweave Knits, which contains my Lutea Lace Shoulder Shell pattern? I haven't! My subscription goes to our U.S. address and my copy hasn't been forwarded. 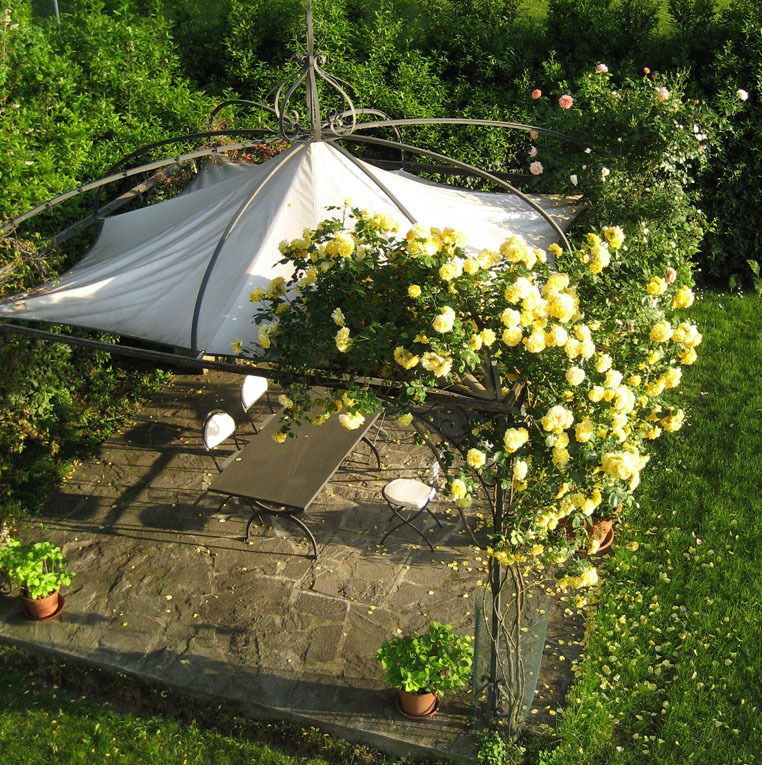 But a couple of weeks ago, I noticed that the roses on the arbor in our yard are a light gold-yellow--just like the Lutea rose! I posted this photo partly because they are gorgeous, and partly because in my haste to send the completed sample in to meet deadine, I neglected to take any photos. I did save the swatch, however, which shows the nice stitch definition and the warm, buttery color of the yarn. (It also shows how much the lace spreads compared to the stockinette). When I originally sketched the idea for this shell, I thought it would be cool to use short rows to shape a triangular area at the chest, and then have angled shoulder sections coming from the upper sides of the triangle, forming a V-neck AND slight cap sleeves. Well, the reason that I note in the pattern that larger sizes may require a crossback or strapless bra (unless you don't mind having the straps exposed), is that when I started working on the mechanics of how to accomplish this, I realized that (A) the larger sizes increase much more in bust circumference than in shoulder width, and (B) the "cap sleeve" really had to end at the point of the shoulder, because it didn't curve to follow the top of the arm, but rather stuck out straight, due to the garment contruction, and would otherwise look like something from Star Trek, or maybe "Dallas" (the TV show, not the city). And this meant that the shoulder section in the larger sizes had to start farther away from the side seam, meaning a more deeply cut armhole. I've just realized that this is a case where a picture would be worth 1000 words, so in my next post I'll sketch what I'm talking about.